Mini KidTown and I went to see world renowned trumpeter James Morrison and the Melbourne Symphony Orchestra perform a special Meet the Orchestra performance at the Arts Centre Melbourne today, and what a treat is was! Designed for children 4 - 12 years, this special concert took families on a musical journey through timeless jazz classics'; Spencer Williams’ Basin Street Blues, Ray Henderson’s Birth of the Blues and Duke Ellington’s It Don’t Mean A Thing (If It Ain’t Got That Swing). 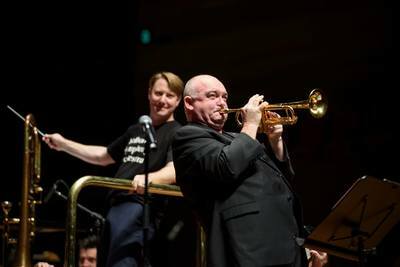 James Morrison; jazz musician, educator and all-round entertainer, together with conductor Ben Northey, introduced families to each musical group (wind, brass, string, percussion) and the instruments of the Melbourne Symphony Orchestra (MSO). Highlights would've been seeing a young girl plucked from the audience and take to the stage to try her hand at conducting. Audience participation with a little singalong to Ellington It Don’t Mean A Thing (If It Ain’t Got That Swing) and of course, James Morrison's trumpet and trombone solos. That said, hearing the MSO perform their musical talent live, was a treat in itself. What an exciting opportunity to discover classical music with arguably the world's greatest jazz musician (who happens to be Australian), together with the MSO; the oldest professional orchestra in Australia. The performance was not long, (45 minutes) but just enough for little children to get a taste for orchestral music. I should add that this is the first Melbourne Symphony Orchestra performance I've been to, but I can guarantee it won't be the last. 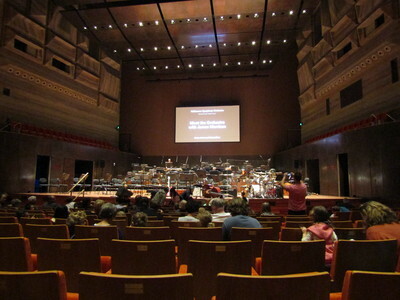 To find out what's on for families in the future head to Melbourne Symphony Orchestra's website here. Future highlights include; Jams 4 Juniors, MSO Peter and the Wolf in Hollywood, plus Harry Potter Live in Concert.